Phuket, Koh Phi Phi, Koh Lanta To Koh Tarutao. It’s pretty straightforward trip to get to koh Tarutao. However it’s worth noting that Tarutao national park will close between the 16 May – 31 October 2019. It can only be accessed in the high season, so please bear that in mind when considering the options below. In order to get to Tarutao during the high season you will have to come through either Koh Lipe or Pak Bara. The simplest way to reach Koh Tarutao from Bangkok is to fly to Hat Yai and then from there take overland transport to Pak Bara and then the ferry from Pak Bara to Koh Tarutao. There are plenty of flights to choose from, Nok Air (currently offer 6 flights per day) and Air Asia (currently offer 9 flights per day) from Don Mueang, Bangkok among other airlines. It is also possible to reach Hat Yai from Bangkok by bus and train. Overnight sleeper trains are a good option for travellers on a budget. Trains depart from hua Lamphong, Bangkok. Buses depart from Bangkok’s southern terminal. Upon arrival at Hat Yai if you have pre-booked you will be met and escorted to the mini bus for your overland transfer to Pak Bara Pier to catch the ferry to Koh Tarutao. If you have not pre-booked there will be travel agencies available on arrival to arrange overland and ferry tickets. You can Pre-book flights, trains, buses and transfers in the search box below. Hat yai has an airport that receives daily direct flights from Bangkok, Kuluar Lumpur, Chiang mai and Singapore among others. It also has a train station with trains departing and arriving from all over Thailand, including sleeper trains from Bangkok. It also has a busy bus station with buses departing and arriving from all over Thailand. In short it’s a major transport hub. It is possible to arrange transport in advance from the airport, train station and bus stop to Koh Tarutao. It is also possible to purchase tickets on arrival from one of the many travel shops. Many of the ferries but not all departing to Koh lipe from Pak bara also drop off at Tarutao. You need to be mindful to arrive before the last ferry of the day to Tarutao. The Langkawi to Koh Lipe ferry runs daily during the high season, so if you wish to approach Koh Tarutao from Langkawi you would first need to clear immigration at Langkawi and Koh Lipe. (They take your passports off you at Langkawi then you get them back at Koh Lipe). Because of the extra time it takes to clear immigration it is highly unlikely you will be able to do it in one day. I would therefore recommend you stay the night or longer at Koh Lipe. Once again tickets can be booked in advance fro Koh Lipe to Koh Tarutao or purchased from one of the many travel shops on Koh Lipe. Phuket, Koh Phi Phi, Koh Lanta along with other islands including koh Libong, Koh Kradan, Koh Mook, Koh Ngai, Koh Lanta, Koh Jum, Koh Yao Yai, Koh Yao Noi in the Andaman sea are connected by ferry, however depending on where you are along the coast it may be easier to get a boat the mainland and then overland transport to Pak Bara and then the ferry to Koh Tarutao as you may not arrive in time to connect with the boat departing from Koh Lipe to Koh Tarutao. 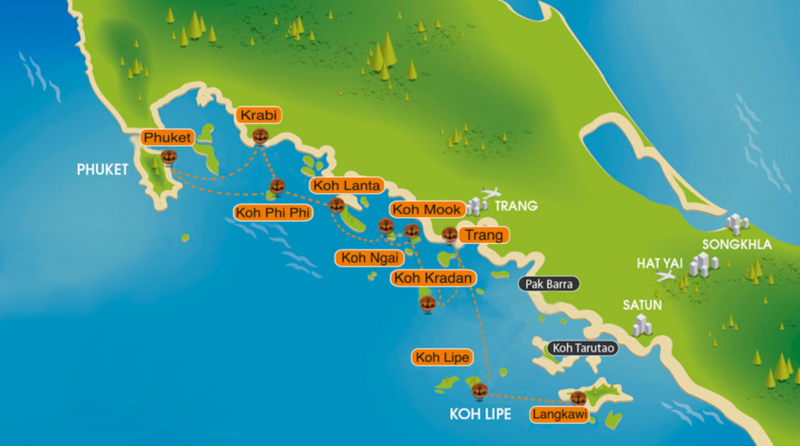 If you do wish to travel from these islands by ferry it is advisable to book a stay overnight in Koh Lipe. Not All routes are open all year round. Arrive Before the last Ferry of the day. Times can be changeable due to unforeseen circumstances like the weather. Give yourself plenty of time to clear immigration at Langkawi and Koh Lipe.